The Weis Wave Plugin is compatible with TradeStation®, Ninja Trader 7®, MultiCharts® and MetaStock® platforms. 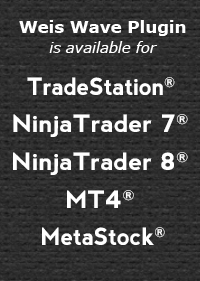 The TradeStation® and Ninja Trader 7® versions can be downloaded from this website upon receipt of payment. MultiCharts® and MetaStock® users should get in touch with us via our Contact page. Upon completion of your purchase of the plugin, you will be directed to an encrypted page where you can download a Zip file containing the Weis Wave Plugin files, installation instructions, and an explanation of the wave and volume settings. You will be required to authenticate your software upon installation. The purchase price is $500. The download link expires 24 hours from purchase. This professionally produced 4-hour video was filmed in 2007 at one of Dr. Alex Elder’s traders’ camps held in the Dominican Republic. Trend reversals refer to springs and upthrusts. 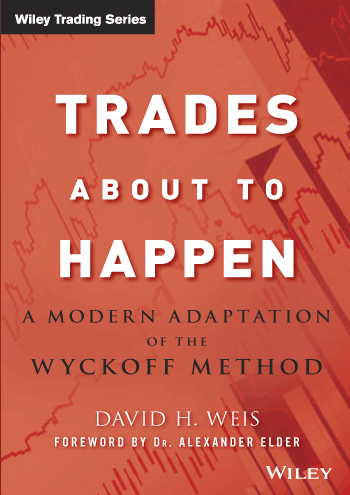 Whenever Weis speaks about trading and chart reading, he begins with the words “You can make a living trading springs and upthrusts.” Trading these setups represents the essence of the Wyckoff method. It involves establishing trades at the danger point where the risk is least and profit potential the greatest. The video contains detailed studies of these two setups on both stock and futures charts—across all time periods; another section deals with the areas on a chart where the highest frequency of trades occur. This video has been highly praised and most buyers regularly re-play it over and over for its valuable information.